When you put your faith in Christ to save you from your sins and trust him as your Lord, the Holy Spirit of God comes to live inside you. The creative power of God begins to change you from the inside out so that you are more and more like His Son, Jesus. Galatians 5:22-23 tells us the character traits of those who follow Christ. Though God is the mighty Creator of the universe, He is gentle and will not force you to change. God’s Holy Spirit is available to help you, heal you, and grow the fruit of the Spirit within you, but only if you welcome His love and nurture the spiritual fruit He wishes to give you. Like a garden—when tended and nurtured—the Fruit of the Spirit grows steadily within you until you reap a bountiful harvest. I challenge you to learn all nine of the Christian virtues listed in Galatians 5:22-23. Furthermore, I challenge you to cooperate and let the Holy Spirit grow them within you more and more. Gentleness is not difficult too understand. We have known people who are gentle and also those who are not. And we see that the Word of God encourages gentleness throughout the history of God's people. The Bible shows that God is devastatingly powerful. However, when God spoke to the prophet Elijah in 1 Kings 19:11-12, it was not in a tornado or an earthquake or a fire or even a thunderous voice; God spoke to Elijah in a gentle whisper. The Greek word the New Living Translation renders as gentleness is “praus” (prah-oos). Some older translations like the King James Version use the word meekness. The same Greek word is used when Jesus says, “Blessed are the meek, for they shall inherit the earth. “Praus”, means gentleness, meekness, or humility. But it does not mean weak! We are to be gentle, like a warhorse. The Lord takes us from a state of wild rebellion to that of total obedience. He moves us from a state of fear to one of unflinching trust in the face of danger. To be gentle is to be full of God’s incredible power, but yet to also speak and act with incredible humility and gentleness. Jesus is the perfect example of the spiritual fruit of gentleness. Matthew 12:19-20 says, “He will not fight or shout or raise his voice in public. He will not crush the weakest reed or put out a flickering candle.” Do you ever feel like a flickering candle, like you're barely hanging on in this life? You feel like the smallest puff of wind might blow you out. Jesus doesn't look at you and scoff about your weakness; nor will he lash out at you so as to snuff out the tiny flicker that remains in your heart. No, Jesus gently comes and guards you and nurtures that tiny, flickering flame until it grows and grows to become a raging fire burning within you. Do you trust him? Jesus is incredibly powerful, but he’s also gentle. And gentle is what we need—especially because we are so broken. When we feel lost and alone, Jesus gently comes to be our best friend. When we’re bruised and broken, Jesus gently come to heal us. When we’ve failed and fallen and given up hope, Jesus gently comes to pick us back up and set us on the right path once again. When we fear our sin has angered God to the point He will turn His back on us forever, Jesus gently comes to forgive and invite us back. And when we feel full of energy and power, or when we feel self-righteous or angry at those who have not lived as they should, Jesus calls us to be gentle as he is gentle. I read this illustration the other day and I share it with you. It is from Richard Foster's book Prayer. 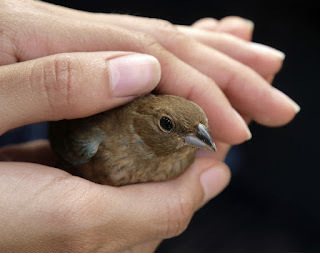 Suppose you find a bird with a broken wing and pick it up to nurse it back to health. How would you hold the bird? Would you squeeze it tightly with all your might? Of course not! That would kill the bird! Nor would you hold it too loosely with hands wide open—for then it might be frightened and try to fly away and fall from your grip in injure itself even worse. No. You would hold the bird gently in cupped hands until it was healed and healthy enough to fly. This is how we are to be gentle with those around us—for everyone we meet is broken in some way. Treat them gently as you would a bird with a broken wing. As Christians, we have incredible power. It is not our own power. It is the power of the Holy Spirit of the Living God inside us. We often don't realize our power. Like a grown 200 pound man who often doesn't realize how his slightly raised voice sounds booming and frightening to a small child, we often don't realize the amazing power we wield as God's adopted children. With great power comes great responsibility. We must constantly remind ourselves to be gentle. We must pray the Holy Spirit plants the seeds of gentleness within us. We must nurture the seeds of gentleness so they grow into abundant Fruit of the Spirit within us. For we want to be like Jesus. Though he was the Lion of Judah, he humbled himself, laying down his life on the cross--even forgiving those who nailed him there. And thus, our gentle Christ brought salvation into the world. And he gently calls to you, "Come Home. Come Home."